In 1976, the Hawaiian monk seal was classified as an “endangered species”. As the official state mammal of Hawaii, the Hawaiian monk seal is the most endangered pinniped species in the United States. With a genus-record dating back to more than 15 million years; there were once millions, now there are only 1400 Hawaiian monk seals left on earth. By definition, an endangered species is one that “is in danger of extinction throughout all or a significant portion of its range.” Most Hawaiian monk seals are found in six main breeding subpopulations in the Northwestern Hawaiian Islands: Midway Islands, Kure Atoll, Pearl and Hermes Reef, Laysan Island, Lisianski Island, and French Frigate Shoals. It’s hard to fathom that this iconic creature has been classified in the same category that the Western Black Rhinoceros, the Great Auk, and the Caribbean monk seal reckoned with before they vanished, but it is. Since that classification, the Hawaiian monk seal has declined in populace over the past 30 years at an estimated average of 4% per year. 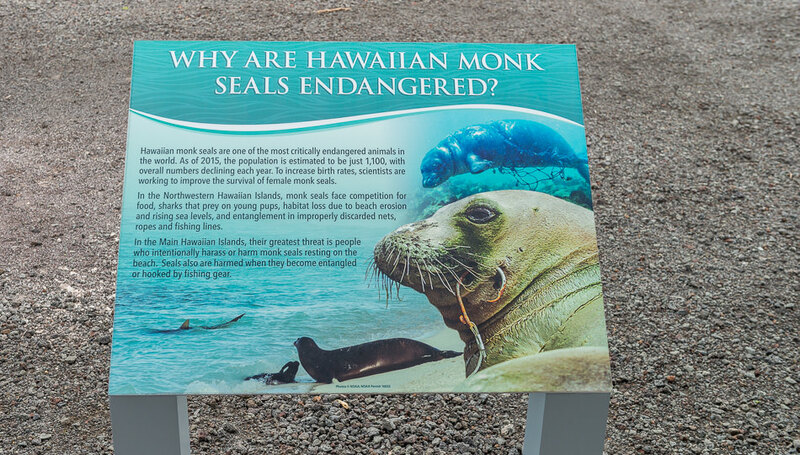 Yet, with public education, awareness, response, and hope, together we can help the Hawaiian monk seal beat these odds. We recently sat down with Dr. Claire Simeone, Veterinarian and Hospital Director at Ke Kai Ola, The Marine Mammal Center’s hospital and education center for Hawaiian monk seals, to find out why the Hawaiian monk seal is at risk and the Center’s outstanding efforts to help this species survive. Dr. Simeone served as Conservation Medicine Veterinarian at The Marine Mammal Center’s hospital in Sausalito, California. As the largest marine mammal center in the world, it is supported by a staff of 70 and over 1300 volunteers. Since its opening in 1975, their operations in California has saved over 22,000 marine mammals: sea lions, harbor seals, elephant seals, Hawaiian monk seals and even dolphins and whales. The Marine Mammal Center has extensive collaboration with the National Marine Fisheries Service, a government agency responsible for protecting marine mammals in the United States, as well as NOAA’s Hawaiian Monk Seal Recovery Program, where they track the species, evaluating the different risks to the population. In 2014, The Marine Mammal Center opened Ke Kai Ola, a hospital dedicated to Hawaiian monk seals on the Big Island of Hawaii. Open to the public during the week, visitors can learn more about this fascinating species and how they can help its survival. After years of experience in studying marine mammal health, rehabilitation and impacts on our oceans, Dr. Simeone’s placement as Ke Kai Ola’s Hospital Director was a logical evolution leading the first ever rehabilitation facility devoted to the endangered Hawaiian monk seal. “Prior to Ke Kai Ola’s opening, there were a variety of volunteer organizations for outreach and stranding response with NOAA carrying a large amount of the responsibility assessing animals in need in the Northwest area of the islands. However, there wasn’t a dedicated hospital for long-term care and Ke Kai Ola is proud to play that role”, stated Dr. Simeone. 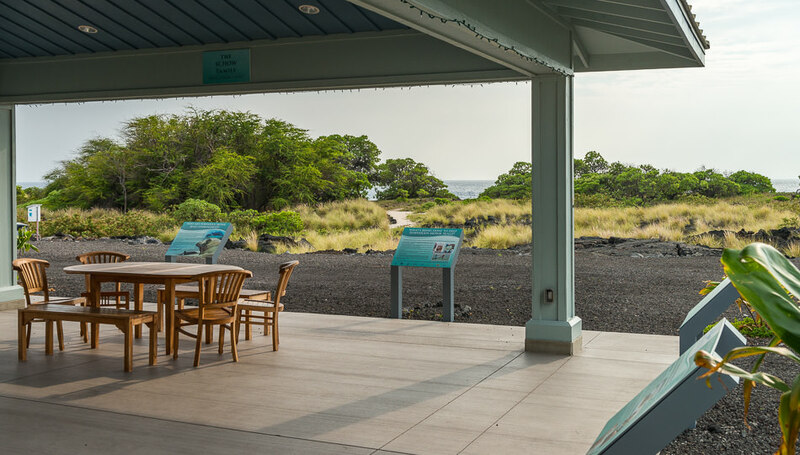 Located in the HOST park near Kona, the center is surrounded by organizations focusing on clean energy, ocean conservation and sustainable technologies. 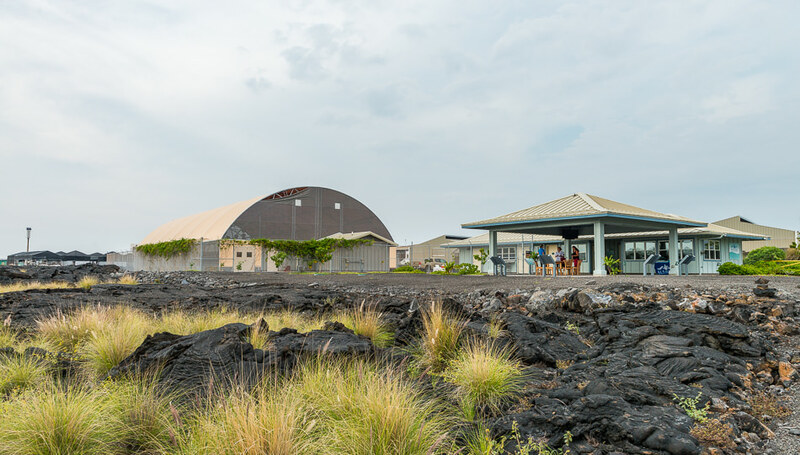 The National Energy Laboratory of Hawaii Authority (NELHA) administers the innovative green economic development park and provides resources such as cold, deep sea water that helps keep the recovering Hawaiian monk seals comfortable with clean, non-chlorinated ocean water. It’s no surprise that Ke Kai Ola translates into “The Healing Sea,” a place of refuge, where Hawaiian monk seals can be brought to get well, eventually being released back into their ocean home. Ke Kai Ola is unique from a non-profit standpoint as about 85-90% of its funding comes from the public. Additional funding comes from government grants, foundation grants, scientific grants, and corporate support, but the majority comes from individual donors where people know they are making an impact and really helping. 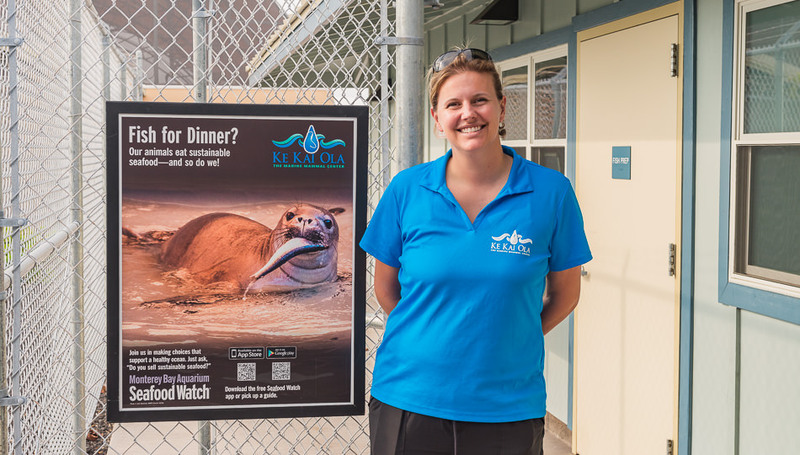 The team at Ke Kai Ola is responsible for not only rehabilitation but also Hawaiian monk seal-related stranding response outreach and education for the Big Island of Hawaii. Sylvester Orosco serves as Response Manager. 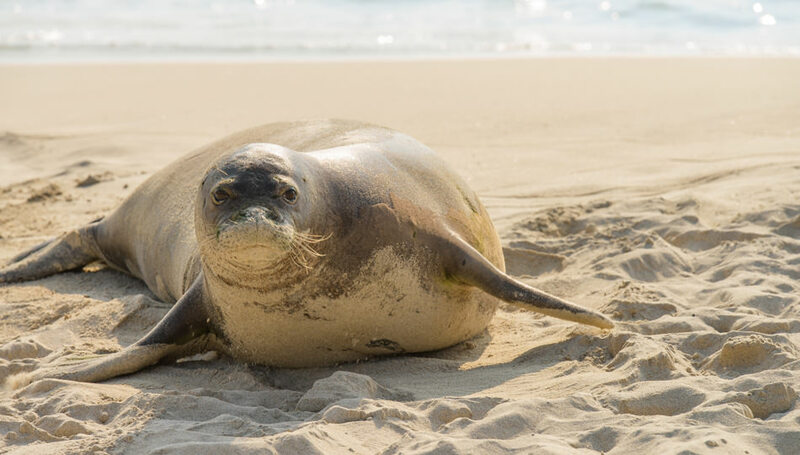 When a Hawaiian monk seal comes up onto a beach, Ke Kai Ola has a core team of trained volunteers who go out and educate the public to keep them and the seals safe. The response team also aids in data collection from the public that is shared with NOAA. Dr. Simeone continued, “As there are so few of these mammals left, this reporting helps Ke Kai Ola understand patterns, where the seals are, what they are doing, where they are going, if they are reproducing and keeping moms and pups safe. When seal pups are young, being weaned from their mom, and just learning to forage, that’s when there is the highest mortality. The majority of patients coming into Ke Kai Ola are in this vulnerable stage. Once they get past their second year they tend to do well and can live to be 25 to 30 years old, but there’s a lot of mortality in the younger population. During that stage, it’s important that the public stays away from them as to not separate the mother and the pup. A Hawaiian monk seal pup should weigh about 150 pounds after it is weaned and often they come to the center starving, weighing only 30-40 pounds. Hawaiian monk seals have a diet that consists mainly of fish, squid, octopus, and lobster that they hunt mainly at night and then rest on sandy beaches during the daytime. They are solitary animals, keeping largely to themselves except during mating and when caring for their pups. Mating season is from December until mid-August. Pups are approximately three feet long at the time of birth and weigh about 35 pounds. They spend about 6 weeks with their mother while they nurse. If you see a Hawaiian monk seal, whether in the water or on the beach, you should maintain a safe distance and do not approach it. If the seal is noticing you, you are too close. It is very important and helpful if you report sightings on the Big Island to the 24-hour hotline number 808-987-0765. Hawaiian monk seals may also have a flipper tag with a number, if you happen to see the tag number, it is helpful information to convey to the response team using that same phone number. The human-induced threats are visible; with marine debris and ocean plastics creating a huge issue for all kinds of wildlife species. On display at The Marine Mammal Center in Sausalito CA, visitors can see the impact of 400 pounds of marine debris pulled out of the stomach of a single sperm whale discovered postmortem. 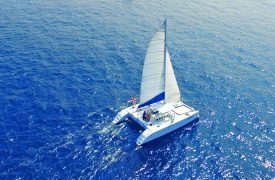 It is estimated that in the past 15 years NOAA has helped remove over 900 tons of plastic off the Northwest Islands of Hawaii and that is just the tip of the iceberg. The protected area off the coast of Hawaii is a vortex for ocean debris due to the North Pacific trade-wind currents. A mega-gyre of floating plastic, estimated to be larger than the state of Texas pours a steady stream of marine debris onto certain Hawaiian beaches, encroaching on the habitat of marine animals, including endangered Hawaiian monk seals and endangered hawksbill and green sea turtles. The majority of Hawaiian monk seals live on small, shallow atolls, so as our oceans rise, those atolls become submerged. Because the females return to the same islet where they were born to give birth, they may find nothing to come back to, so they have to find a different birthing location. 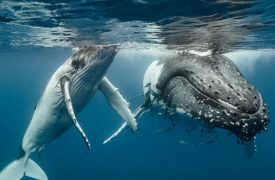 “In such a changing environment, affecting all marine mammal species that we work with, they are having to adapt to new threats and new challenges. Some are adapting well and some are not adapting well,” added Dr. Simeone. An estimated 1100 Hawaiian monk seals are in the Northwestern Hawaiian Islands, and fewer than 300 reside in the main Hawaiian Islands. 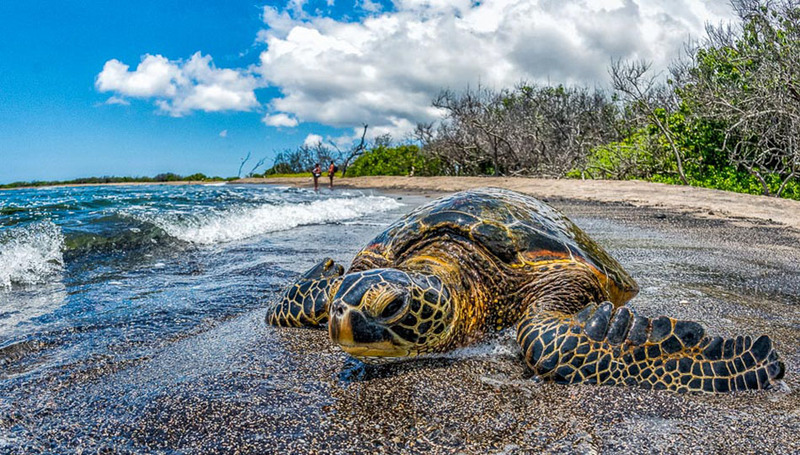 Historically the Northwestern population is declining where the population in the main Hawaiian Islands is doing relatively well considering all factors against their habitat. Also on Ke Kai Ola’s team is Tara Spiegel, Marine Science Program Specialist who works with the Center’s education department building education initiatives and the volunteer educator program. The Hawaii Educator Program, Nā Kōkua o Ke Kai, is a middle school program working with teachers on the Big Island reaching about 500 students each year. This program helps bring Marine Science Education into schools as well as educating students onsite at Ke Kai Ola and at the Mokupapapa Discovery Center in Hilo. This education program connects them with conservation and science, so they can see it in action and be inspired to do that work. Another key member of the Ke Kai Ola team is Megan McGinnis serving as Animal Care Manager. With a decade of marine mammal husbandry experience, she coordinates the husbandry team, ensuring patients are fed and provided for during their rehabilitation at Ke Kai Ola. The Marine Mammal Center has a thorough rehabilitation program tying into their scientific research in California. Each test sample collected in the course of treating the animal is shared with more than 16 different institutions around the world including the Hawaiian Monk Seal Research Program and the National Institutes of Science and Technology, ensuring each sample is used to the fullest. 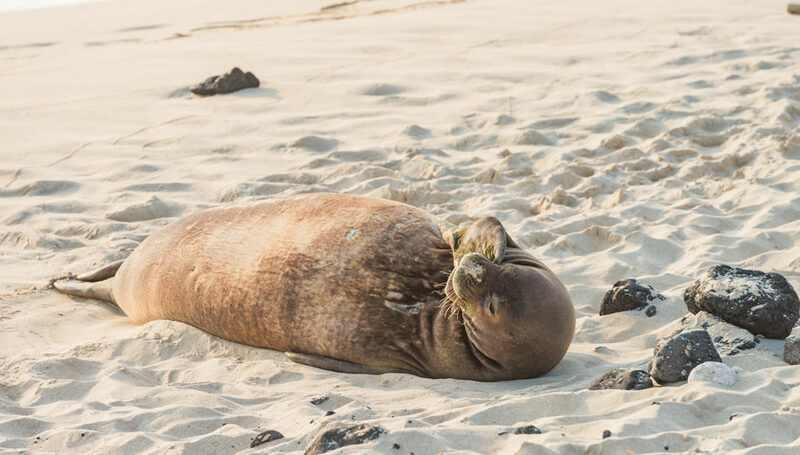 In 2016, NOAA Fisheries launched an effort to vaccinate Hawaiian monk seals against the Morbillivirus, a genus of the measles and canine distemper virus. Seen as a sizable threat in other large seal populations; in Europe, there have been large die-offs and it is a potential threat if a seal is exposed, spreading quickly with the population potentially decimated. Monk seals are susceptible to this virus because they are isolated, and their immune system is naïve to it. 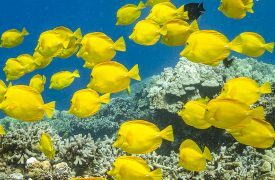 This effort by NOAA and Ke Kai Ola is the first ever vaccination initiative on a wild marine species. As we sat outside of the Ke Kai Ola hospital listening to the ocean waves crashing along the Kailua-Kona shore, the center has a sense of tranquility, yet emboldened with purpose and at-the-ready emergency support for this endangered breed. 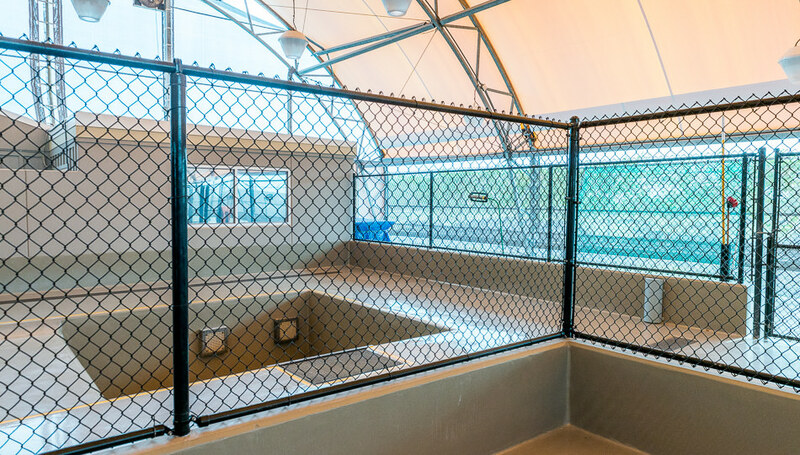 The facility has advanced medical equipment on site as well as the mobility to go to the animal if transport to the facility is not feasible. As marine mammals are susceptible to eye issues; eye ulcers, scratches, and cataracts from overexposure to UV light was a concern in designing the pool and pen area. 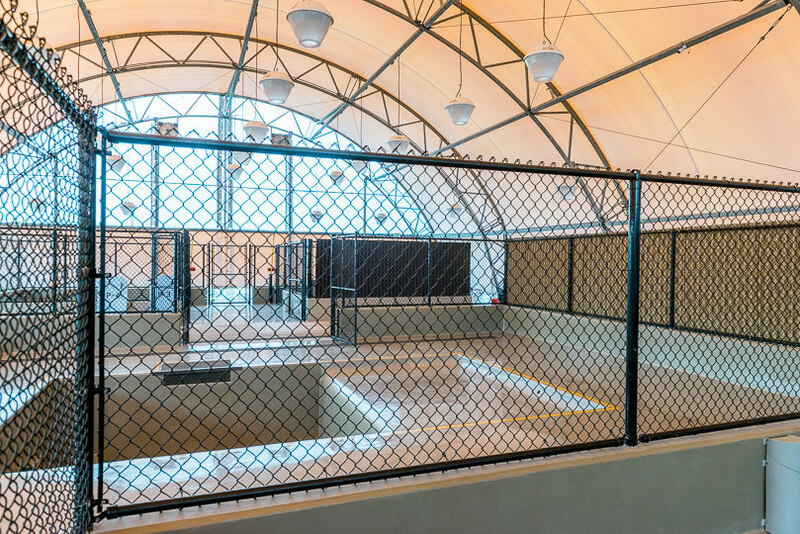 The area is covered with a mesh material for sun protection, while still allowing free-flowing fresh air and has epoxy flooring painted the color of sand to minimize glare. The engineering of the National Energy Laboratory of Hawaii Authority (NELHA) facility allows for the routing of cold, fresh deep ocean water into the pool area preventing the use of ozone or chlorine which causes irritation to the eyes. The team also has in their toolkit, a gel that is actually used in human medicine to serve as a barrier for the eye allowing for healing and effective antibiotic distribution. It’s a humbling feeling seeing Ke Kai Ola and knowing that their small team of staff and volunteers is tasked with saving a species from extinction. It can bring a sense of helplessness wondering how you can help make a difference, looking at the odds. But after meeting Dr. Simeone and learning about Ke Kai Ola’s dedication to the beloved, Hawaiian monk seal, we came away with a determination to help get the word out. With so few of these beautiful animals left on earth, they need our help for survival. There are many ways to get involved and shine hope for the Hawaiian monk seal. Be the hero and become a Ke Kai Ola member, donate, adopt, or volunteer and let’s take action!